Nevada’s gaming surveillance officers are a fundamental part of the state’s gaming industry, providing necessary oversight and security for both management and customers. Their importance to the Nevada gaming industry is reflected in their wages, which are some of the highest available, for the role, in the US. The gaming industry’s total economic impact in Nevada during 2016 was nearly $69 billion, making it the single most significant financial contributor in the state. The sector also accounted for 468,000 jobs during the past year, totaling around 36% of Nevada’s combined employment base. The sheer success of the gaming industry in Nevada has created significant employment opportunities within its ranks and excellent job security for those it employs. What Does A Gaming Surveillance Officer Do? Provide Security And Monitor The Gaming Environment – A gaming surveillance officer is responsible for monitoring gambling establishments for cheating or theft by employees and patrons. They use a variety of equipment, such as video and audio surveillance systems and one-way mirrors, to observe the establishment’s gambling area’s, cashier’s cage, and front desk. If they find a violation of company policy or state legislation they may be called upon to intervene directly and work with local authorities in the resolution of the situation. Ensure Compliance With All Local, State, And Federal Gaming Laws – One of the key duties of the gaming surveillance officer is to ensure that their employer complies with all local, state, and federal gaming laws and to report any infractions of those to the Nevada Gaming Commission and the Nevada Gaming Control Board. Conduct Internal Investigations – In cases of internal theft, the gaming surveillance officer may be called upon to conduct an internal investigation. This may include gathering surveillance data, interviewing staff and submitting a report to management. Prepare Court Cases – In instances where cheating or theft by patrons is discovered, the gaming surveillance officer is expected to collate all documentary and surveillance evidence and assistant state prosecutors to help in convicting suspects. Generally, the minimum requirement for the role of a gaming surveillance officer is a high school diploma. However, there are a number of factors that can significantly increase your chance of successfully applying for the position. Have Desirable Qualifications – While a high school diploma is the minimum you’ll need to apply to be a gaming surveillance officer, employers are increasingly looking for applicants with an associate’s or bachelor’s degree in criminal justice or a related field. Our Criminal Justice program will provide you with all the required legal and investigative skills you’ll need to make your application stand out. Leverage Personal Skills – Applicants with a background in law enforcement or who have previously worked in the gaming industry may have an advantage during the application process, so be sure to note relevant experience on your application. Because of the clerical responsibilities of the role, experience in office management, loss prevention, human resources and data entry can also help to progress your application. Northwest has a dedicated and experienced Career Services team who work closely with our graduates who achieve a criminal justice certification, helping them utilize the full range of their skills when applying for their ideal position. 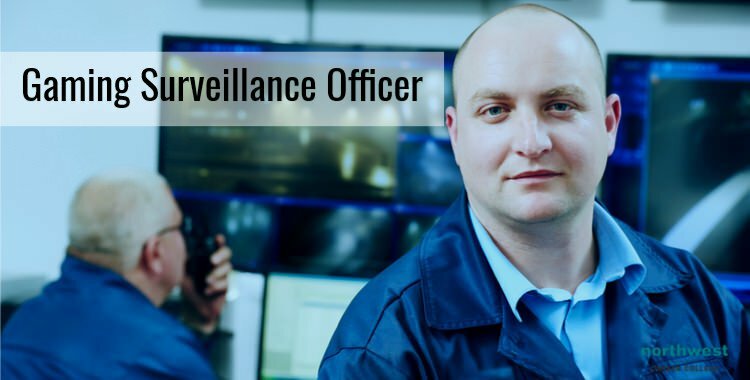 Train On The Job – Once your skill and qualifications have secured you the position of gaming surveillance officer, you’ll be expected to complete further training on the job. This can include specific training in operating surveillance systems and further education local, state, and federal gaming laws. This on the job training serves to expand your skill set, which can then be used to access further career opportunities. The role of a gaming surveillance officer comes with a significant responsibility to provide security and oversight for both your fellow staff members and your employer’s patrons. Here at Northwest Career College, our Criminal Justice Program offers you all the skills you’ll need to step up to that responsibility and the benefits that come with it. Call one of our enrollment specialists at (702) 403-1592 to find out how we can help you become a gaming surveillance officer. Our course offers hands-on instruction in all facets of Criminal Justice, with flexible campus-based and online classes to help accommodate your work and family schedule. Call us today on (702) 403-1592 to find out how you could graduate in as little as 18 months! Previous Blog: Medical Assistant vs Medical Administrative AssistantNext Blog: How Much Can I Earn As A Paralegal in Las Vegas?